What if you are told that it is possible to gain weight with less exercise and good diet? Yes, the secret is prier nutrition. People, who want to gain weight, generally have this behaviour: they exercise hard, but don’t care about nutrition. Hence, the time and effort spent gets wasted. The reason because they think taking proper diet or nutrition is a complicated task and hence, they tend to avoid this topic. Thus, it totally becomes vital to understand how nutrition plan works and how to utilize it properly to gain fitness and strength. This plan will work for anyone of any age, provided you take a proper consultation with your doctor before stating anything. We all are unaware that cottage cheese contains pure casein protein. Casein protein is a digesting protein that works very slowly, which means this is best for weight gain. This is very helpful for men who don’t have any choice but stay without eating for longer duration. Not to forget, cottage cheese is also rich source of vitamin B12, calcium, and many other essential nutrients. You can also buy the non-fat or low-fat versions of cottage cheese. Eggs has good quality protein, 9 most essential amino acids, Choline, right amount of fat and vitamin hence, this is the best most value for money. Also, eggs doesn’t harmful your health in any way. Lean Beef must be staple of your diet if you want to gain weight. The reason Why? Because, it contain many things conducive to the growth of muscle. On average, a 3-ounce serving of lean beef is just 154 calories, yet it can provide 10 essential nutrients containing zinc, iron and B-vitamins. This also gives the body some high quality protein and a good level of amino acid that can work with insulin to stimulate muscle growth. For those people who are trying to reduce weight, this must be a great news – a three-ounce serving of lean beef can give you the same amount of protein as one and half cups of beans, but half its calories. Skinless Chicken Like beef is a best source of best quality protein, which is essential for maintenance and repair of muscle, good bone health, and maintenance of weight. You can also prepare them in many ways like you do it for chicken. You can easily find them in the store with chicken meat cut into 1serving sizes. You can season and cook them quickly for best taste. The reason why whey protein supplements are very popular supplement in the weight gain world is since they give a fast and easy source of protein at very cheap price. Weight gainers normally tend to use them when they wake up in the morning, after the workout, and mix them with some other meals. However, for regular people, you can just use it right after your workouts for very effective muscle mass gains. But, you can’t rely on this completely though. It is very important to get good quality protein obtained from whole foods, and take whey protein as a boost. Whole grains are very easy to digest and gives more nutrients compared to refined grains. This also gives sustained energy levels and good overall health. For the purpose, brown rice can be really useful to stimulate the growth hormone levels that are critical for inducing fat loss, lean muscle growth, and gaining strength. Eating for weight gain? Firstly go for fruits and vegetables that are the richest source of antioxidants. This is required to get healthy functioning of the immune system and they also contain many other nutrients such as vitamin E, vitamin C, and beta-carotene. Finally, the body needs the fiber from these fruits and vegetables for weight gain by helping to flush out the substances that your body doesn’t need. Tuna and many Other Fish are the richest source of protein, low in fat, and contain good amount of omega-3 fatty acids. The vital nutrient omega-3 fatty acids are the key here. These are vital not only for health purposes, but to improve fat loss and maintain the proper functioning of the body processes, such as metabolism. 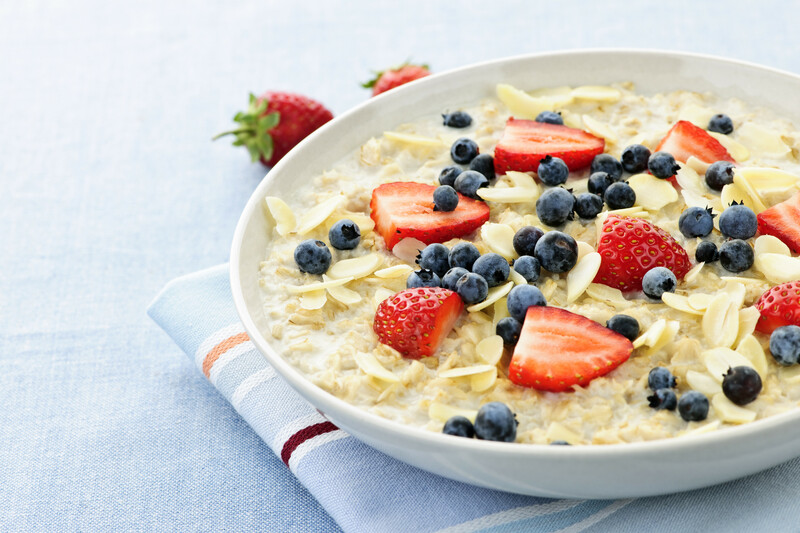 Oatmeal is the best source of carbs, as it has low glycemic index (GI) value and it is very minimally processed. To sum this up, this helps in enhanced fat loss for those who want to lose weight and a good source of carbs for those who want to gain weight and preserve them. We shudder at the thought of taking fats, but good fats are required for muscle growth. In fact, they are very important for hormone production like testosterone and growth hormones that is mush needed for muscle growth and strengthen. This also elevates your metabolic rate that is useful to shed more fats. In addition, fats are required for many vital maintenance functions. Polyunsaturated and monounsaturated fats are known as the good fats. You can get them from nuts, leafy vegetables, salmon, other fishes, and oils like flaxseed, avocados, and their seeds. They are also the best source of omega-3 and omega-6 fatty acids. The above mentioned were the diet that you can include to gain weight. Hope this was useful. Please leave your feedback below!! !